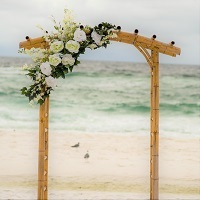 Add a Silk Arrangement to your Bamboo Arch. Tropical, Romantic, or Wild Flower. Size, Flowers, and Colors will vary and be based on your wedding colors. *This selection includes Flowers Only. Bamboo Arch must be requested separately.